Several people have asked me if the flattening yield curve is a warning of impending weak growth or even a recession. My answer is not yet. Here’s why. Usually long-term bonds offer a higher yield than short-term bonds, a feature described by the yield curve, which plots the interest rate on bonds as a function of maturity. The slope of the curve is often summarized by the spread between the yield on a 10-year U.S. Treasury security and a 3-month Treasury bill. 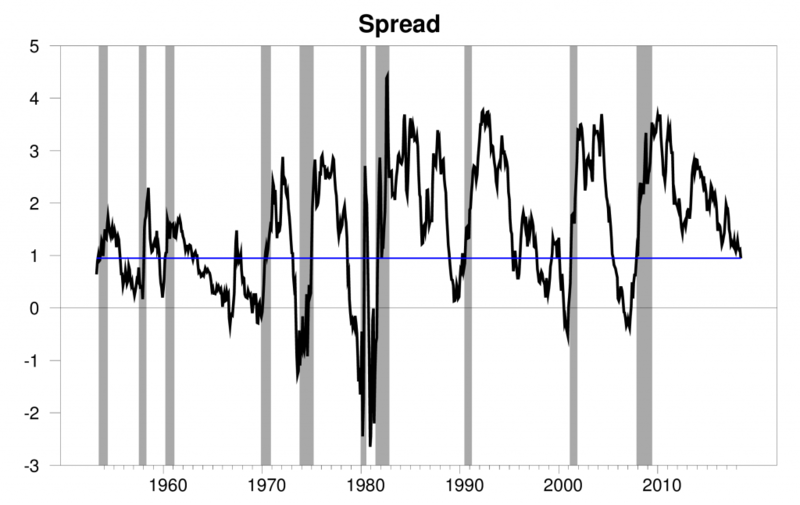 A lot of economic research has concluded that if that spread becomes lower, it may predict slower economic growth. If the spread becomes negative, that is, if a 3-month T-bill offers a higher yield than a 10-year bond (referred to as an “inverted” yield curve), it’s as useful a predictor of a pending economic recession as we have. Difference between interest rate on constant 10-year maturity Treasury bond and 3-month T-bill on secondary market, monthly Apr 1953 to Jun 2018. Horizontal line is at 0.95, the value on June 28. Shaded rectangles denote NBER recession dates. The spread has declined significantly since the end of the Great Recession, and now is down to 95 basis points. That’s below the historical average around 150 bp, but not that much below. 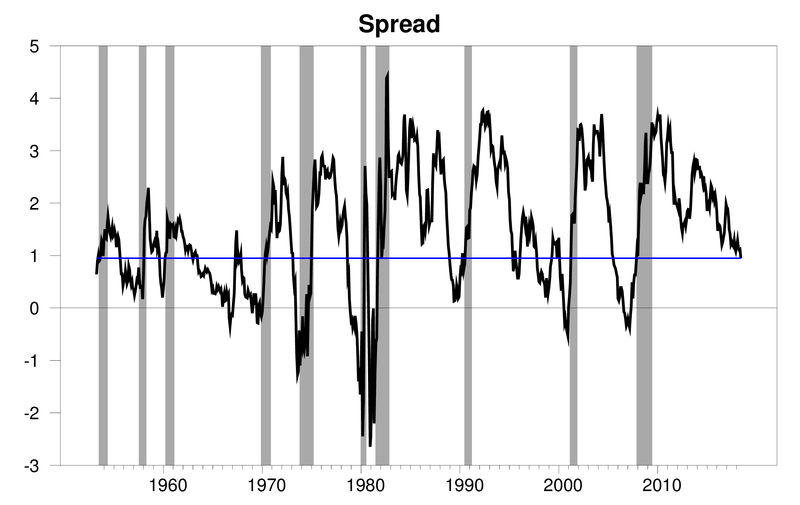 In about a third of the months since 1953, the spread has been that low or lower. Why does a low or negative spread predict future economic weakness? One factor may be the Fed’s tightening cycle. Historically the inflation rate would at times start climbing above where the Fed wanted it. The Fed responded by raising the short-term rate, the traditional instrument of monetary policy. The market response of long-term rates to the higher short rates was significantly more muted. The result is that the yield spread narrowed as the tightening cycle continued. The Fed often found itself behind the curve, and the last short-term rate hikes were likely a contributing factor to some historical economic recessions. Top panel: interest rate on 3-month T-bill. Bottom panel: year-over year percentage change in consumer price index. Horizontal line at 2%. But we’re still very early in the current tightening cycle. The 3-month Treasury bill has not gone up so far by nearly as much as it did in previous complete cycles, and inflation is still very moderate. So I don’t think it’s time to run for cover just yet. However, if the Fed were to raise the short rate by another 100 basis points without any move up in long rates, we would be into inverted territory, and I would be very concerned. Not a danger sign yet, but definitely an indicator to keep watching. This entry was posted on July 1, 2018 by James_Hamilton. Menzie Chinn, Master of Puns, only to be rivaled by the late (but never forgotten) Louis Rukeyser. Lou baby, your pun crown is safe (for now), and the CNBC TV dum-dums still can’t touch you. You and Paul Kangas are still at the top brother. Martin Zweig was a fixture back in the market then (known as the quintessential worrywart), Peter Lynch was nearly a bigger name than Warren Buffett at that time, and before she had some kind of procedure done on her face, Elaine Garzarelli was quite the looker (face and legs as I seem to remember) and known for her “quant” skills, before “quant” became a trendy term. Linda O’Bryan was a great host as well, and unlike most of the narcissistic female anchors of today, knew what business news was about—business news. I could go on quite the non-“PC” rant on these female anchors, but I’ll spare you all today. Suffice it to say, why would I trust someone to give me free markets news, who proudly runs around telling everyone she paid 10 times what she should for a cup of coffee at Twinklebucks so she could look at froth bubbles at the top of the cup like a 4 year old and display the Twinklebucks cup on Twitter like it was a mathematics award?? A great post. What are your thoughts on Gov Brainard’s comments regarding inversion: “there would probably be less adverse signal from any given yield curve spread” and thinking that this time may be different due to lower yields long-term yields relative to what we’ve seen historically due to both a lower term premium and lower neutral rate. It seems that Gov Brainard feels movements in the yield curve should be taken in tandem with other macroeconomic conditions when considering the optimal course of monetary policy. Obviously all data should be assessed, but with inversion being such a strong and relatively early leading indicator, the approach by Brainard to assess inversion within the context of other macro indicators seems a bit interesting. This is one of the better articles I have seen on the yield curve. And I think Brainard makes some excellent points and they seem to ring true to me. Jerome Powell, the Fed Chairman, is expecting strong growth over the next two years. Monetary policy remains highly accommodative in the ninth year of the expansion. And, we had a fiscal expansion, along with other pro-growth policies, which may be timely to achieve a “soft-landing,” although the excesses don’t seem to be in place that would lead to a slowdown or recession. The Fed Funds Rate is about 2%. Perhaps, by the end of 2019, it will be at 3% with core PCE around 2% and no inverted yield curve. The Fed may pause in 2020, since inflation would have been preempted and remain around 2%. Some economists are predicting the Fed will lower the Fed Funds Rate in 2020. Some of the trade disputes may be settled later this year, particularly given the E.U. and China are much weaker economies and more in need of jobs than the U.S. economy. Greater free trade and open markets will benefit the global economy tremendously, although the U.S. will benefit the most. It was a good idea to wait till massive deregulation and tax cuts were implemented to force our trading partners to accept a fair trading system, that hopefully leads to much lower trade barriers or at least a level playing field. How’s that “hopefully” strategy working for you so far? 2slugs, “How’s that “hopefully” strategy working for you so far?” Actually, who knows yet??? Maybe we’ll just wait until the negotiations are settled. You of course can look at the short term. If and when the international trade ends more fair than before negotiations, then we can measure their before and after impacts. What yuo liberals are really objecting to is a President who makes and keeps promises. Liberals also don’t know how to react to the quick economic improvements showing how easy it really was to improve. The comparison of six year’s versus slightly more than one year’s progress is in front of many voters memories today with little chance of significant change by the mid-terms. Yes, the article goes on to do more projections, but are they as correct as the tax estimate? Did the Onion write this or what? BTW – you skipped its real message, CBO projects a deficit over $800 billion. Yes another dishonest rant from the Usual Suspects! CoRev See my comment below. The bump in the revenue surplus is entirely a fluke of the calendar, as the Treasury statement explains. Interestingly, even allowing for the recent tax cuts, federal tax revenues are essentially flat for the last three years — a historical anomaly. Pgl, another reading comprehension example: Me: “Yes, the article goes on to do more projections, but are they as correct as the tax estimate?? Skipped, another of your exaggerations No! Questioned the validity. Kudlow was hoping for a surge in tax revenues even though the reality was a plunge! It’s up to the cheaters and stealers. 2slug, this is a bit off topic, but you raised the issue in another post so I thought I’d let you react to socialists in America: https://www.dsausa.org/constitution . I found this part of Article 2 enlightening: popular control of resources and production, economic planning, equitable distribution, feminism, racial equality and non-oppressive relationships. I’ve never seen a working government based on “popular control”. I’ve seen elected socialists nationalize industries and waste resources and production and really botch economic planning. But “popular control”? Bruce Hall I suspect that “popular control” refers to the soviets, or workers’ councils that sprang up across Europe towards the end of World War I, until Lenin squashed them. Rosa Luxemburg was big on popular control of the means of production until Lenin had her shot. Another more interesting and almost contemporaneous example would be the workers’ councils under Tito’s Yugoslavia, as discussed in this old classic: https://yalebooks.yale.edu/book/9780300049640/after-revolution. The decentralized Yugoslav experiment wasn’t a complete bust, but in general centralized planning of production is a recipe for disaster. Wow, PT, you really believe this insane trade war of Trump’s is going to lead to freer trade? This is more delusional than most of what you post. At best, he will pull back and there will be some nominal adjustments amounting to nothing as he did with South Korea when it became impossible to go hard on North Korea while trying to have a trade war with South Korea. Of course for doing anything with China he completely blew it by dropping out of the TPP, an anti-China trade group, our obvious allies to help squeeze China. But no, he is picking trade wars with most of them as well, no help to be expected from any of them. How blazingly stupid. Of course, his family did get a half billion dollar bribe from the Chinese in Indonesia three days before he declared that we needed to save Chinese jobs at declared national security risk, ZTE. At least he is making money out of it, and the Dems and the media are not making much of a fuss about it. He is getting away with the most blatant and by far the largest bribe ever paid to a US president of any sort, much less from a semi-hostile foreign power. Barkley, I’d say you lost it, but I doubt you ever had it. Obviously, you have little or no idea what’s been going on in international trade. And, Barkley, there’s also a “war” trying to get our NATO partners to spend their fair share on national defense, which they still haven’t done. I guess, you believe Trump sending letters to them last month to get them to meet their obligations is “delusional,” and won’t lead to more NATO spending. You should be happy Trump will no longer allow foreigners to take advantage of the U.S., or maybe you’re one of them. Your other comments are even crazier than the normal wacko leftists comments. Your usual I’m rubber you’re glue garbage. Excuse old lying punk. Barkley has written some excellent discussions over at Econospeak. Of course they address actual economics so it is no wonder you do not understand them. Now hurry along for the next episode of “economics” ala Fox and Friends! I bet George Orwell’s 1984 is selling out. After all Kudlow says tax revenues are way up even though they are really down. Oh wait – Kudlow hoped they would rise. OK! And in the face of a raging trade war – other Trumpians claim what Team Trump is really doing is pushing free trade. Or was that what they hope will happen! A yuuuuge drop last quarter. Someone should call Larry Kudlow and teach him how to basic research! no he says he was talking about future expected performance, not actual performance today. still want to defend him with that comment teaparty? And magic will occur so Q2 will show a doubling of Federal tax revenues? Seriously? We’ll have to wait for 2018 2nd Qtr numbers to be released. I have my guess. What’s yours pgl and baffled? CoRev According to the Treasury statement the April surplus was the highest (nominal) value ever, as you said. But read the actual report. The April expenses were pulled forward into March ($45B) and receipts increased by $19B because of an extra day of collections. In other words, it was due to a calendar fluke. As a result, the reported surplus was very large, but that’s largely illusory. The lesson here is to never believe the nonsense coming from Newsmax. Taka lesson from St. Ronnie….trust but verify. Your repeated this dishonest cherry picked quote? OK! Your lack of a response is what I expected!! You are aware that people send their taxes into the IRS in April, right CoRev? That’s based on 2017 events. The numbers for May 2018 are out, and they showed an increase in the deficit of nearly 70% vs May 2017. And we will likely see YTD revenues for FFY 2018 go below 2017’s total with the next report that comes out next week. And what happens when China and other foreign countries stop bidding on T-bills to finance that debt? Higher interest rates and inversion, as Menzie references. 2slugs and Jakeformerly of the LP, of course I know April is the largest month for tax collections. It was the record setting increase. Teh monthly Treasury Reports explains some maybe most, but not all of that increase. I know you folks don’t want to admit nor discuss the higher employment and higher wages on revenue, but they too have an effect. We’ll actually have to give it a couple of fiscal years to see their trends. Not much different from Q1. But then I do not base my forecast on what Trump or Kudlow hopes will happen like you do. Don’t be so hard on Kudlow. After all, he was one of the first to congratulate the Knicks for signing LeBron to a 10 year contract. Bottom line: Federal receipts actually look quite OK through the first four months, with weakness in Feb-Mar offset by a 12% yoy increase in April. For Jan-April as a whole, receipts are up 4.2%, not far off nominal GDP growth. On the other hand, outlays continue to grow quickly, up 5.7% Jan to April compared to last year. As a result, the deficit has widened. Assuming pro rata allocation as in 2017, the annual budget deficit might reach about $745 bn in FY 2018, up about $80 bn (+12%) compared to last year’s FY deficit of $665.8 bn. three quarters of a trillion dollar budget deficit (and growing) in a growing economy and “record” employment, in one of the longest recoveries in history, aided by the “biggest” tax cuts in history. what is wrong with this picture? Krugman must be reading Peaky’s comments. Maybe we should call Peaky – Potemkin Peaky! How are you measuring the accommodation of the FED. By historically long low interest rates? By real interest rate? Do you look at any the traditional growth of the M’s? At what point will you decide easy money is no longer available. More rate hikes per year? A downturn in the economy? Ed, the cost of borrowing is low – the Fed has done an excellent job keeping inflation expectations low with a combination of jawboning and actual rate hikes. Notice that this rate was zero at the end of 2016. It is now 0.6%. So this real interest rate has increased. I do trust your pre-K arithmetic lessons have proceeded such that you get this simple point. Yes – real rates are not what they were under St. Reagan but there are increasing. The Goldilocks economy? PeakDishonesty has dusted off Goldilocks 3.0! “Jawboning”? In what way has the Fed been jawboning? And do you think that would be an appropriate tactic for the Fed? I thought you were supposed to be a pure market guy. “Jawboning” sounds like the kind of political interference in the market place that you should oppose. But then again, you’re really not a market guy, just a crony capitalist kind of guy. Jawboning has been replace with 4am Twitter rants! He is not measuring anything. He is repeating Trump’s latest tweet. soft landing from what peaky? your comments makes no sense, really, other than a cya statement. Jim….. Jimmy Jimster!!! The jimerinooooooohh!!!! The JimMeister!!!!! Jimmatola!!! The JimmyMan!!!! JimaLimma Jimdingdong!!!! Leavin’ the room!!! Walkin’ away……. Professor Hamilton, if you do a similar analysis of the 2 to 10 year spread, you will see that it is already at a level (under .35%) that has forecast at least a slowdown in roughly 12 months (1984, 1986, and 1994 iirc), even if it never inverts. Which is the better signal? Who knows!?! The yield curve is one of several indicators I watch. But not a one of those I watch has a perfect record, including the yield curve. So before I get to worried about a negative yield curve, I would like to see it confirmed by other indicators. Maybe quality spreads that are starting to widen. JDH One factor may be the Fed’s tightening cycle. If I’m understanding you correctly, you’re saying that because of lags between short and long run effects there is a tendency for the Fed to overshoot rate hikes, which tips the economy into recession. Am I right in thinking that the 2001 recession would be the kind of thing you had in mind? Also, you said “one factor” might be the Fed’s tightening cycle. This suggests you have a couple other possible factors in mind. Another topic for another post? Nothing of the sort. The inflation expectations have been kept low by factors not within the control of the US Federal Reserve. In fact, the US Federal Reserve has failed to reach its inflation target for quite some time. It is important to understand the paternalistic thinking behind the 2% inflation target. Markets would apparently not adjust as well with near 0% inflation so some positive inflation is necessary to make markets work better. Ironically or not, at the end of the day, the poor and financially unsophisticated are the ones who lose in a game that has a number of zero-sum aspects to it. But as long as they appear not to understand, everything is fine. There has been a whole world of central banks having trouble meeting its inflation target, but that seems to be changing. The FED obviously is seeing in its indicators that inflation rate is rising and is now attempting to keep it from growing too far above 2%. I had a little trouble understanding what you propose. Is it a zero inflation rate? This is from the same dude who flat out lied about his own link on Iowa land values. Until you own up to that one, no one should take a word from your seriously. The fact that inflation expectations are low means the Fed’s jawboning and actual rate hikes worked. The Fed has successfully preempted inflation with fewer rate hikes. 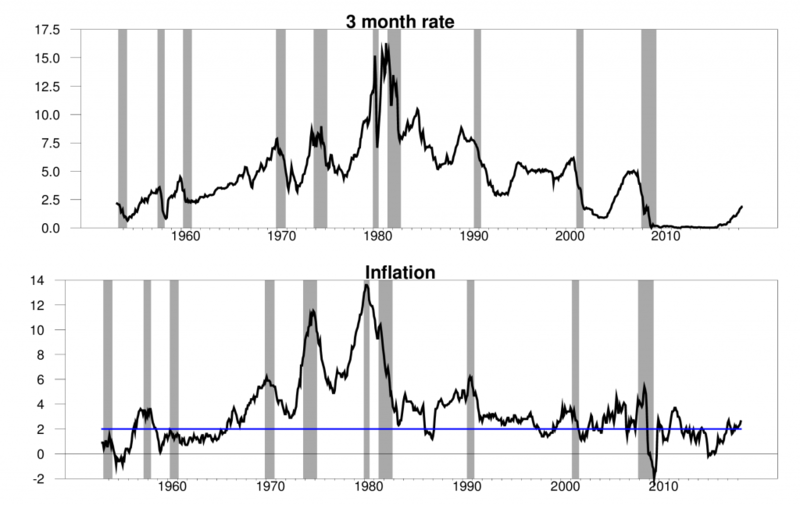 There has been inflation and the Fed prevented deflation before. Oh dear; there you go again. It has already been pointed out that the Fed had done no “jawboning,” not none, not no how. Do you even know what that is? As it is, the Fed seems to be moving fairly cautiously. It is probably the best functioning part of the current economic policymaking apparatus, the one where Trump left the Obama holdover team more in place, although he has appointed little of it anyway. Yes, he got rid of the eminent and highly capablel Janet Yellen, but at least Powell is “Janet Yellen lite,” and on this Trump’s instincts as a real estate guy fearing too much disruption of interest rates may have served him well in avoiding certain other possible picks that some in GOP were pushing for when he made his selection. Barkley, the Fed has telegraphed to the market it will preempt inflation, which has kept inflation expectations low and require fewer rate hikes in this tightening cycle. So, we have strong economic growth with low rates and inflation. I expect the tightening cycle to end with a 3% Fed Funds Rate. Just because you’re totally ignorant of jawboning doesn’t mean there hasn’t been substantial jawboning. Please show us where the Fed is “jawboning”. Thanks. 2slug asks you a question regarding what is and is not in this. No mention of jawboning so I guess you do what you always do – duck and run! I have a 2nd question – where in this short document does the FED mentioning telegraphing. BTW – we all expect you to duck and run away from my question too. The Fed is always and everywhere against excessive inflation, but as core inflation remains below their 2% target, they are not going out of their way beyond completely normal statements regarding it. Traditionally “jawboining” is something presidents do, with I think the term originating with LBJ or maybe JFK or in the 50s. It involves presidents speaking loudly against specific industries making specific price hikes, sometimes backed by threats to punish them if they do. If anything it has been Trump who has been jawboning, with his most recent effort aimed at oil prices and OPEC. It appears that the Saudis have made a move to respond favorably to his request with some increase in output, but they seem to face limits on that, and his efforts to block Iranian oil exports of course work the other way. Lately oil prices have gone up, so his jawboning in this areas has been pretty much of a flop. But the Fed is doing zero jawboining. Really, PT, google the term and see how it is used. Nobody has ever talked about any central bank “jawboning,” just you in your pathetic ignorance, while claiming others do not know what it is, such as me. Sorry, buster, you are the one who is miserably ignorant and out to lunch on this totally, worse than your usual mistakes. I have done some checking, and the term jawboning is occasionally applied to Fed statements. But nobody is currently identifying anything coming out of the Fed as being that. They have been on a long track to try to “normalize” financial markets by gradually raising interest rates back towards historical averages. There has been some recent upward creep of the core inflation rate, with it about at 2%, which fits with what the Fed would like to see, more or less, but also shows that the actual jawboning by Trump, which has been identified as such in the press, has had much anti-inflationary impact, and if anything his trade war may well push inflation up as all the tariffs start to take effect. Apparently the term came initially into widespread use under JFK and continuing with LBJ, although there appear to have been earlier uses. All of these referred to presidential “moral suasion,” or in WW II the price setting agency, but not the Fed. Meant to say that Trump’s jawboning has NOT had much anti-inflationary impact. Obviously, 2slugbaits, Barkley, and Pgl never even took a Money and Central Banking class. Many believed the Fed began the tightening cycle too early and some prior rate hikes weren’t needed. Nonetheless, the Fed telegraphed it was determined to preempt inflation, although the core PCE was well below 2%. Consequently, inflation expectations were lower and fewer rate hikes will be needed in this tightening cycle. PeakTrader Well, yes I did take money & banking….in fact, from a visiting economist from the Richmond Fed. You linked to a 5 year old WSJ article written by someone who is not a professional economist. Back in 2013 Bernanke was the Fed Head. Now if “jawboning” was something that he considered to be something in the Fed’s toolkit, then you’d think he might have mentioned it during his time at the Fed. So I went to the index of his 600 page autobiography. Guess what? The word “jawboning” doesn’t appear. The WSJ might think “jawboning” is something the modern Fed does, but apparently Bernanke and Yellin and Jerome Powell don’t think so. Then again, the WSJ is a Rupert Murdoch paper so there’s no accounting for nonsense. Why do you insist on repeating this same old intellectual garbage over and over? It was garbage the first time and you keep spreading it. WE KNOW PeakyBoo never took a single course in economics or finance. I bet Barkley has taught such classes. I certainly have. And yes – I have published peer reviewed articles in several monetary economics journals. Of course these articles are beyond PeakyBoo’s reading comprehension so these childish rants is all he’s got! Now had PeakyBoo ever took an economics class, he would realize that the rise from zero to 0.6% in terms of the real interest rate is moving in the wrong direction. But no – Peaky keeps telling us that real interest rates are low. Well 0.6% is not 6.0% like they were under St. Reagan but they are rising. Furthermore Peak’ys alleged keeping expected inflation low via “jawboning” tends to keep real rates higher. But Peaky gets this backwards. Given his incessantly wrong rants, may I suggest Peaky never take Money and Banking as his professor would have to give him an F.
so we have data to suggest the 3 month-10 year spread is an effective predictor. does the level of the 3 month or 10 year yield also have an impact. i.e. if the spread shrinks, but the real (or nominal) interest rate on the 3 month is high or low have an effect on the predictor as well? is it a one or two parameter predictor? baffling: No. 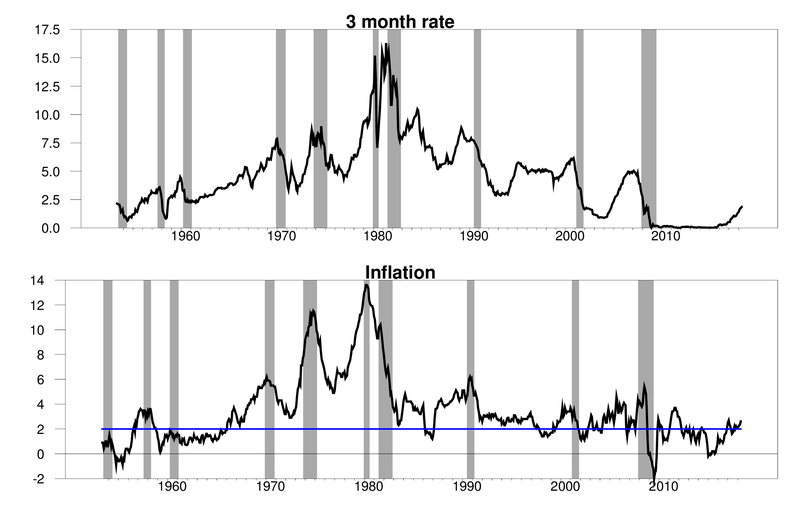 Rate levels are not good forecasters of recession versus no recession. I am not aware of any variable that forecasts slowing economic growth with any kind of useful consistency. Both level and inversion are important to confidently call a recession in advance. Level is per the short rate. The pertinent short rate is the real fed funds rate, with real determined by the core CPI. The necessary condition is real fed funds be above 2%. The further sufficient condition is yield curve inversion. Furthermore the short rate must be rising. If all these conditions are met a recession is virtually certain. If any one is not met, there can be no conviction in a recession call. At this moment the real fed funds rate is negative. One can see by this that the next recession is far distant. By my calculations the next recession will not arrive until Spring 2020 at the earliest. Emphasis on at the earliest as Trump policies are building a sustainable base of growth unlike any since Reagan. More important than anything else by far is driving a silver stake into the heart of corruption. The light show of silver flashes is about to begin. It will light up the entire globe. Is the inverted yield phenomenon peculiar to the US, or is there any evidence of a similar phenomenon operating in other advanced economies? 2slugbaits: My favorite paper on the subject: Chinn and Coibion, “The Predictive Power of the Yield Curve across Countries and Time,” International Finance (March 2015). Steven, I haven’t seen that message on my end. This is how CoRev when he has been caught with his pants down flat out lying. He tells more lies – ever stupider than the previous set of lies. OK – a 2.7% real compensation increase would be pretty decent but if CoRev thinks nominal increases and real increases are the same thing, he is dumber than we thought. As stooopid as PeakyBoo typically is, even he knows inflation is near 2%. An 0.7% real compensation increase is really not that great. But CoRev is so desperate to praise Trump – he will claim it is. Stupidity or mendacity. It is really hard to tell with CoRev. Pgl, THANK YOU FOR THE LAUGH! Oh and Happy Independence Day, to you and everyone! BTW, how many employment records need to be set before you can admit, if even only to yourself, that Trump’s policies have made a big difference? I don’t ever expect you to admit that Trump’s conservative policies have proven more successful than Obama’s. Of course, that measure will take another 6.5 years to compare apples to apples. CoRev I’m not sure what you mean by Trump’s “conservative” economic policies. If you mean fiscally conservative, which is the usual understanding, then Trump’s fiscal policies have been anything but that. Trump’s fiscal policies actually represent a kind of triumph of standard textbook macro, which says that fiscal stimulus will push out aggregate demand and lower the unemployment rate. That’s exactly the policy you opposed during the depths of the Great Recession. The bad news is that standard textbook macro also tells us that applying strong fiscal stimulus when the economy is at full employment and the interest rate is above the ZLB will not end well once you get beyond the short run. Recall that the CBO projected a temporary bump (3.3%) in economic growth due to the fiscal stimulus, but then drops to 2.6% in 2019 and settles down to 1.7% after that. So far the CBO projection looks spot on. BTW, how’s that much ballyhooed Trump stock market thing working out for you? 2slugs, your memory is wrong again. “That’s exactly the policy you opposed during the depths of the Great Recession.” My position was that the tax incentives were too small and misapplied. With your memory problems and inability to think outside liberal economic concepts, I’m unsurprised: ” I’m not sure what you mean by Trump’s “conservative” economic policies.”. His policies are those you have panned for years. CoRev Sorry, but you’re flat out wrong. You were in the Tea Party protests against the deficit. Remember? You were the one who said government needed to tighten its belt. Remember? Yes, you wanted tax cuts; but you also wanted equal cuts in spending. Remember? An old man’s memory is not reliable. You should have kept better notes. Traditional conservative fiscal policies are lower taxes and lower spending and no deficits except during a recession when conservatives typically believe in running a surplus. They don’t always follow those claims, but that’s what they like to believe. Traditional liberal policies generally call for higher taxes, higher spending and no deficits except during recessions when liberals believe in running a deficit. You and Trump apparently believe in low taxes, high spending, and big deficits when the economy is at full employment. That’s sheer idiocy. Take Menzie’s advice. Buy an econ textbook. And buy a notepad to help you with your memory. 2slugs, our memories differ on period. To me the depths of the recession were, and I was referring to Obama’s stimulus where you took the Krugman view, too little, and I took the wrong incentive (xfers/extensions to unemployed), the view of too little tax cuts and to the wrong cohort. But we can argue this over a beer better than here. 2slugs is right, corev and ilk wanted cuts in spending and smaller deficits to bring back the confidence fairy. flim-flam man paul ryan led the charge with his magical math, which all you critters fell for hook, line and stinker. The only thing to admit is that you are one persistent fool. Yes by 9/2017 it had risen to 60.4% which is attributable to the recovery we had under Obama. Since then it has bumped up and down but never rising about 60.4%. Is that what you mean by Trump’s policies. Daily inconsistent and incoherent rants which has led to noise but no net improvement in employment. C’mon CoRev – we know you have no clue about economics but you can’t be bothered to even get the employment data right? Weak even for you. A reasonable response would have been to either the employment records or Trump policies claims, but no you went zinging off on your own issue. That says much about your own ability to admit and rationally discuss anything about Trump. How many times must the employment records be published before you can even admit they exist? Wishing they didn’t exist and then changing the subject is not a policy comparison. The TDS is so strong it clouds everything you write. employment performance was ridiculed under the obama administration even though he brought the rate down tremendously from the damage of the bush administration. just curious why all you curly critters wanted to use the u6 numbers to disparage obamas performance, but now conveniently use the u3 to tout your records? hypocritters. Can you imagine what it would be like to have a president that said whatever popped into his head? Can you imagine what would it be like to have President that made promises and then kept them successfully? Well, now you don’t have to, and quite the treat it is. few promises have actually been kept. but he is hurting plenty of his base, too bad they are too stoopid to understand the damage. but we do have a president who enjoys bullying us citizens and companies to get his way. when he is not grabbing p*(^y in his spare time.